Hotelier Apr 19 2019 5:34 am Still my no1 favorite Japanese actor. 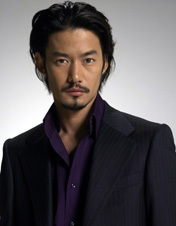 I'm sad his character died in Gibo to musume no blues, but it's a very nice drama. I think Yutaka Takenouchi have that cool vibe with him. Just finished watched your movie Nagare Boshi in English title Shooting Star. Honesty I'm grazy to see you :-). Good looking and nice voice. Bariton voice :-) Really I was watched many times that movie cos I want to see you many times too. Your acted as a brother for Maria your younger sister very... very....touching my heart. You are a gentleman brother, even you made a decision looked grazy, as you said just focus to the illness of Maria.You made contract married with Risa and finally you fall in live with Risa. I like the ending "Let's go home together," you said to Risa. Kawada Feb 09 2013 2:40 pm Love him together with Takashi in "Beach Boys"!!! Chris Nov 08 2011 9:00 pm @tutut Its hard to find the movie, you lived in Jakarta ? Maybe you can find it in Glodok, you can find BOSS Season 1 VCD (1 BOX 10 VCD) in Glodok, but honestly I don`t know the Price. Good Luck ! londonsoul Dec 18 2009 12:08 am I love this guy his voice just melts my heart. whoah!i never expect he's in the late 3o's.........i really admire him so much! i love the the way he acts and deal w/ his co-stars.......... .........just wanna say,i love this guy!